NATURAL HABITAT AND PREFERRED SITE: Natural habitat is the Trans Pecos and Edward’s Plateau of west Texas but it adapts to a wide range of soils but drainage is critical. It will not survive in heavily watered or high rainfall areas. It would not do well in deep east Texas. IDENTIFICATION INFORMATION: Desert willow is a small, open, lacey tree with beautiful summer flowers, yellow fall color and decorative seed pods. FLOWERS AND FRUIT: Flowers form in showy clusters on the tips of the branches on new wood. They are trumpet or bell-shaped, fragrant and predominantly light pink to light violet, although some pure white flower plants exist. Flower shape resembles lips. 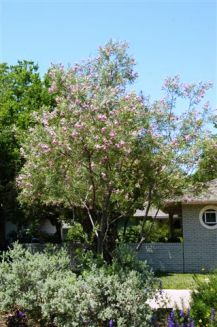 Desert willow blooms from late spring to early fall (June to October), depending on rainfall. Fruits are long, narrow capsules 5 to 8 inches containing flat, hairy, winged seeds, typical of catalpa members. BARK: Smooth when young: dark brown, ridged and scaly as the tree matures. FOLIAGE: Opposite or alternate, long, narrow, pointed 3 to 10 inches long, light to medium green and often sticky to the touch. 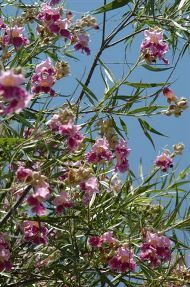 CULTURE: Desert willow is easy to grow in any soil that is well-drained but it cannot stand constantly moist soil or wet feet. Disease organisms in the root system will take it out. Trees that are in trouble should be treated with the Sick Tree Treatment and have the water reduced if possible. PROBLEMS: Root rot from over watering. It’s also not easy to find in the nursery industry. PROPAGATION: Gather the seeds from late summer through fall when the pods have dried and turned brown but before they split open to release the light feathery seeds to be blown by the wind. Seeds lose their viability quickly in storage but can be kept over the winter in the refrigerator. It is best to plant the seeds immediately on collection. Soaking the seeds with a mild solution of vinegar before planting will increase germination. As with most trees avoid heavy applications of fertilizer. Cuttings can be rooted from semi-hardwood cuttings on the current year’s growth taken in the late summer or from dormant cuttings taken in the winter. It is best to keep the cuttings under intermittent mist. INSIGHT: Branches have been used to weave baskets. Wood is light, brittle but durable and has been used by Indians for making bows, also used for fenceposts and fuel. Desert willow is a good bee plant. Benny Simpson in his book A Field Guide To Texas Trees says that the tree is attractive when grown to its full height but also when pruned back heavily and kept at 3 to 10 feet.